Tied to Lunar New Year celebrations in early February, the event helped to spotlight efforts by parole agents and parolees who have been helped to make SAFE a model community-law enforcement partnership. 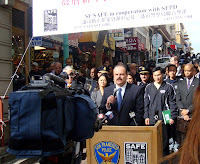 SAFE is a non-profit organization that guides residents, business owners and community groups to improve the quality of life in their neighborhoods. It provides education and support about public safety while assisting in identifying and resolving crime and violence issues. Parole agents and parolees on their caseloads have been involved in this endeavor for more than 10 years by graffiti removal efforts and passing out flyers about community events.